So do you remember a little while ago when I was invited to the launch party for this beautiful new home called The Regency? 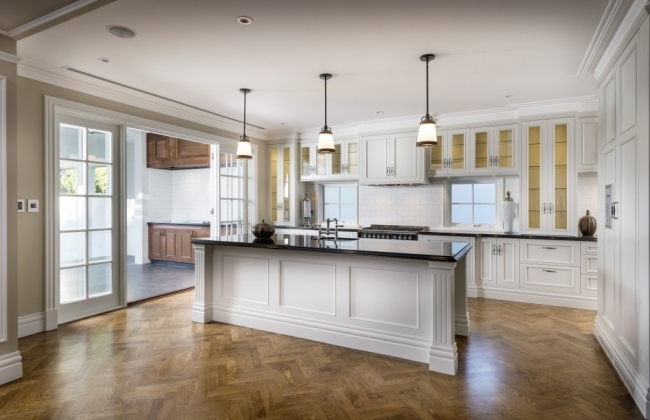 This recently completed, three-level mansion is one of the latest spec homes designed and built by Oswald Homes and they decided to celebrate by throwing a decadent launch for more than 120 guests. I wore shoes that hurt and tried not to stand too close to the bevy of Lisa Ho models that made me look like Gollum. I was stoked that House Nerd was the first media invited to see this gorgeous home, and I had a lovely time doing a walkthrough with Oswald Homes general manager David Hochwald-Jones the other week. If you’ve been reading House Nerd for a while you’ll know that I personally tend to gravitate towards older homes. I like places that feel lived-in and warm, but I do fall in love with special new homes and this one was really lovely. 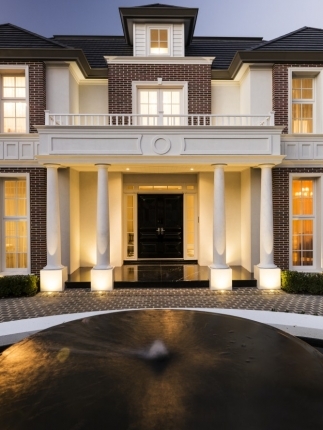 ABOVE: A sweeping cobblestone horsehoe drive leads past a water feature and up to the marble-tiled entry portico, flanked by Plantation-style columns. 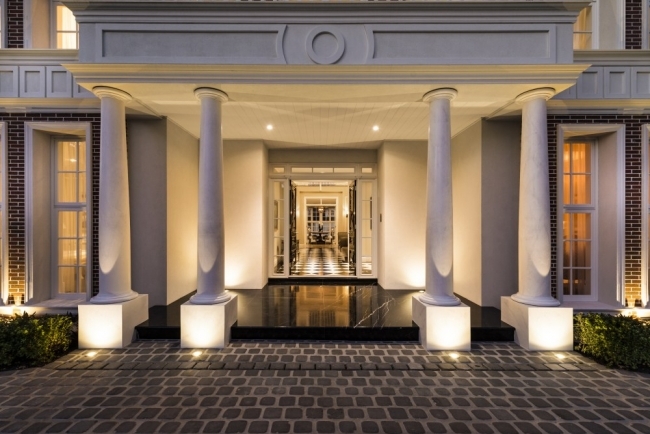 ABOVE: Symmetry nuts will appreciate the entry, which has double black, lacquered timber doors that open onto a capacious entry foyer. 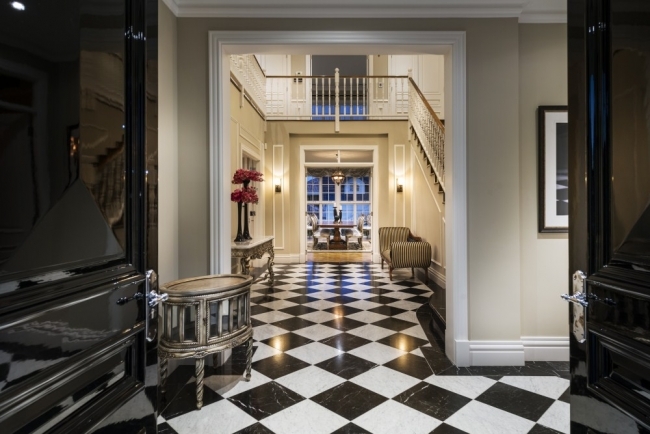 The portico is tiled in black marquina marble while the entrance foyer features a marquina and Carrera marble chequerboard floor. 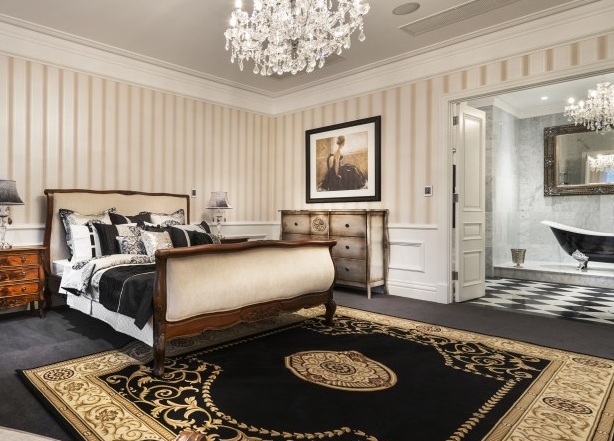 ABOVE: UK-born Oswald Homes general manager David Hochwald-Jones says one of his personal favourite features of the home is the double door entry - twin high-gloss, classic black lacquered doors that make a strong statement. "This is my hint of Downing Street," he laughs. 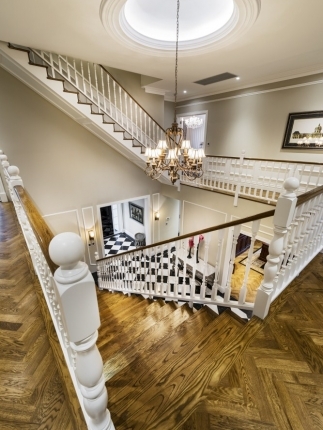 ABOVE: The grand French oak staircase wraps around the entrance foyer. It's the kind of staircase that ladies walk down very slowly in films when they're making a grand entrance. Which reminds me of that Gilmore Girls episode when Rory goes to the dance and walks into the living room wearing her dress and Sookie cries, "Oh my god. You're a movie star. I'm serious. Oh my - at some point tonight, walk down a flight of stairs. Movie stars always walk down staircases." I hear you, Sookie. 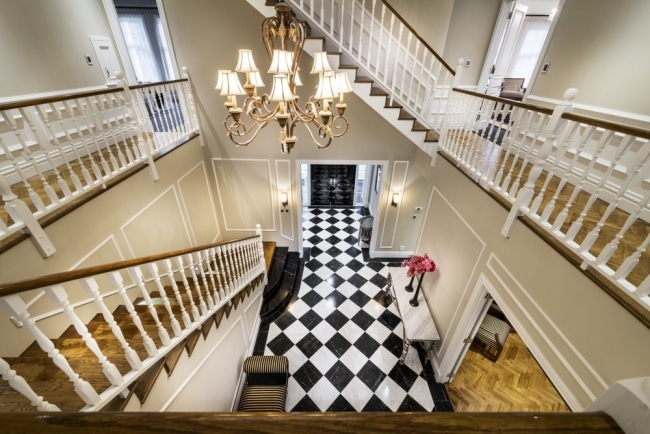 The staircase behind the chandelier leads to the attic, where a central window overlooks the treed neighbourhood - a perfect place to read. Perhaps I liked it so much because even though it was so new and grand and opulent it still had a warm, welcoming feel - you know you could feel very comfortable here. 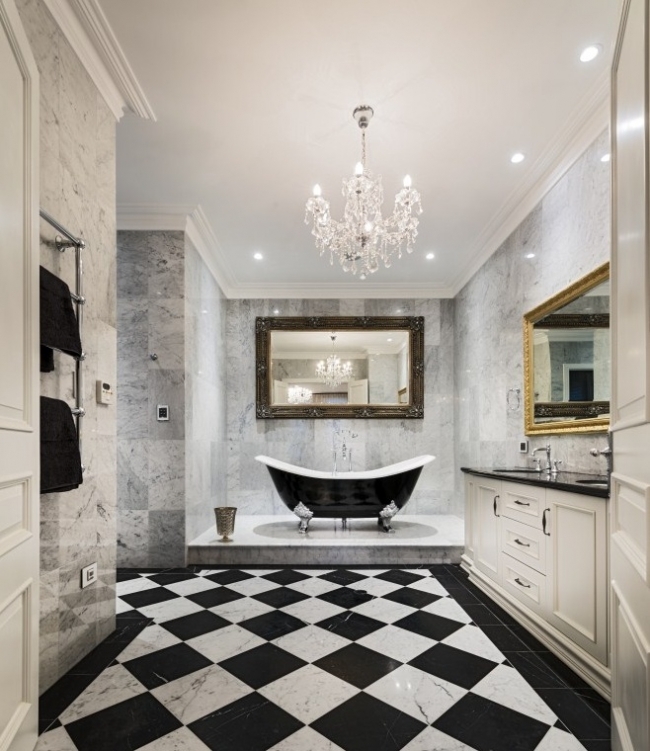 Yes there may be beautiful marquina and Carrera marble polished floors. But you also know that if you were home alone you would TOTALLY be doing a Tom Cruise in Risky Business and sliding across them in your socks and undies. Well I would. I’ve titled this story the English manor-style home but the architecture cannot really be categorised neatly into one category. 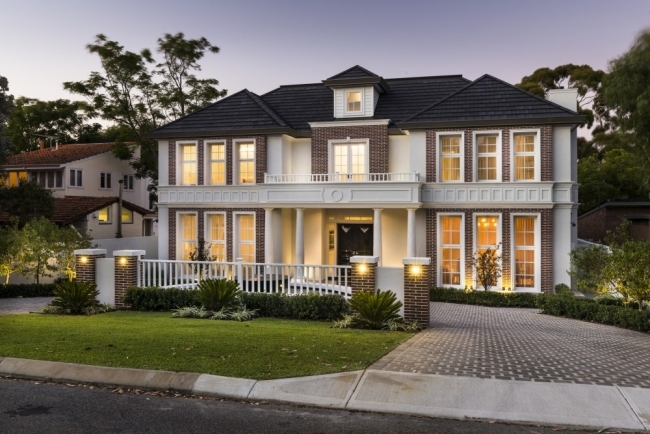 It’s a unique blend of architectural elements from the Regency era, hence the home’s name, with influences of Plantation, Hamptons and classic European style and it works so well. David says the house embraces what Oswald Homes have been doing recently by going back to classic architecture. ABOVE LEFT: A water feature at the front entry, with a marble tiled balcony above the branches off the dressing room. ABOVE RIGHT: Walnut-stained French oak herringbone flooring runs throughout the landing, the study and the open-plan living areas. ABOVE LEFT: The entrance foyer, hung with central chandelier. ABOVE RIGHT: A peek into the drawing room, one of the more formal spaces. 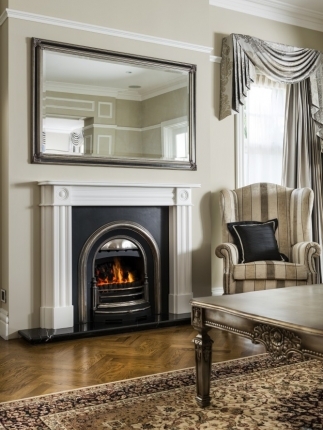 It features a marble gas fireplace. 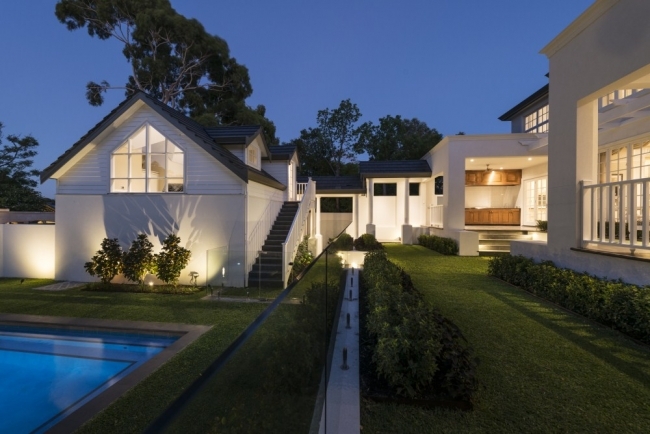 ABOVE: At the back of the house is an open-plan lounge, dining and spacious kitchen. 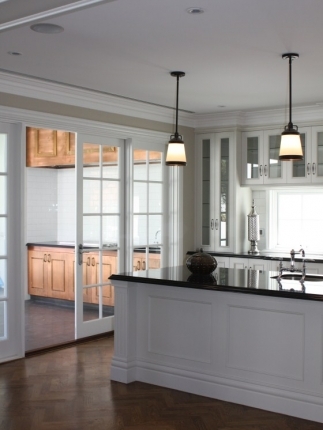 Bolection moulding to the walls, picture lines and walnut-stained French oak herringbone floors give a classic look. 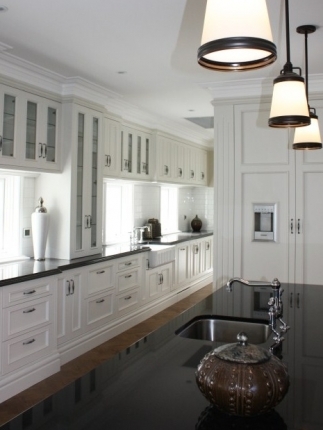 ABOVE: The kitchen features black granite benchtops with a white subway tile splashback, feature lighting and an expansive scullery with caterer's access, walk-in pantry and big built-in cool room. ABOVE LEFT, THE KING OF BUTLER’S SINKS: In the kitchen, granite benchtops have been teamed with a classic subway tile splashback and an original Shaw’s butler’s sink, imported from the UK (at the back of the kitchen). “There’s butler sinks and then there’s butler’s sinks,” laughs David. I love butler’s sinks – there’s something so classic and country about them. Makes me want to scrub potatoes or something. ABOVE: Each bedroom in the home has its own ensuite. This is the main suite with double doors that connect it to the ensuite. 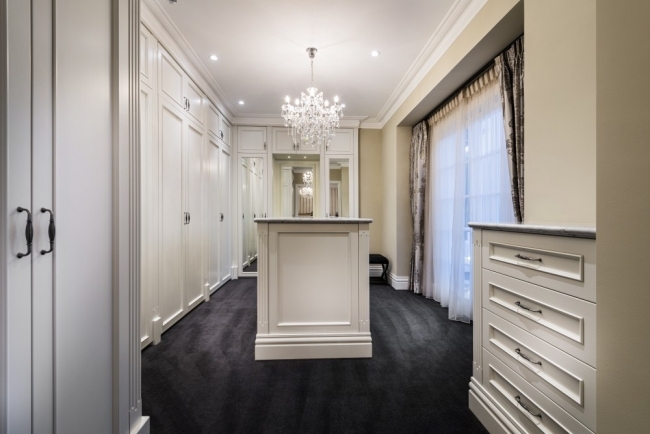 The main also encompasses the beautiful dressing room, below, with makeup table and central jewellery table. Off here is a balcony with a marble tiled floor - a romantic spot. ABOVE: Take a soak in the clawfoot bath in the ensuite of the grand main suite. The cast iron clawfoot bath sits on a marble plinth that is one huge, solid piece of Carrera marble. "It was brought in with a lot of nerves!" laughs David. ABOVE: The dressing room to the main suite with French doors to the balcony. The balcony reminded me of the one in Lorelai's childhood bedroom at Richard and Emily's house. Yeah I'm in a Gilmore Girls mood tonight. ABOVE: In the back garden, a walkway connects the alfresco area to the triple garage at the rear. Up that cute staircase is a self-contained au pair apartment that overlooks the swimming pool. It's small but cosy with Enid Blyton-esque sloping ceilings. ABOVE: The au pair bedroom on the left overlooks the pool. 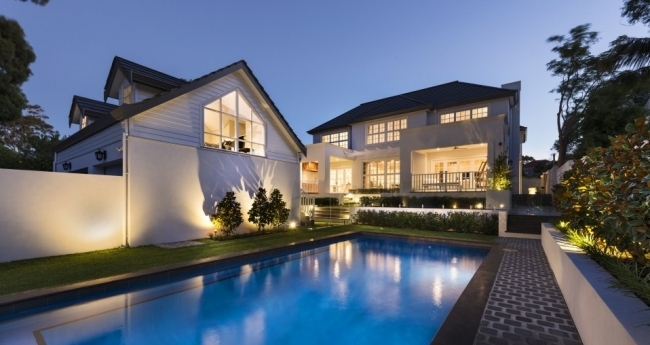 This place is on the market with one of my favourite real estate agents, Peter Clements of Mint Real Estate. (I know, it’s bad but after meeting hundreds of Perth real estate agents over the years I do confess to having favourites). Joel Barbitta of D-Max Photography. Five photos by me. No prizes for telling which ones.